The eye is a very complex organ with an incredibly important function. Each part of the eye plays a special role in the visual process that allows us to see. An abnormality in any part of this complex system can lead to problems with your vision. The eye can be thought of like an instant camera, only without the need to wait for the image to develop – light rays reflected off an object are processed into an image that we see in real time. The iris acts like the diaphragm on a camera to control the size of the pupil. When there is a lot of bright light, our iris reduces the size of the pupil to let less light in. On the other hand, in low-light environments, the iris lets the pupil increase in size (i.e. dilate) to allow more light into the eye. The cornea and lens work together to focus the light rays onto special light-sensitive tissue at the back of the eye – known as the retina – which is like the film of a camera. Cells in the retina convert the light into electrical signals that are sent to the brain, via the optic nerve, for processing, allowing us to see the image. The anterior chamber is the fluid-filled space in the front of the eye, between the cornea and the iris. Also known as intraocular fluid, this clear, watery liquid is produced by the ciliary body and flows through the pupil into the anterior chamber. Aqueous humour consists of 99.9% water and 0.1% sugars, vitamins, proteins and other nutrients. Aqueous humour helps the eye maintain its pressure and provide nutrients to the internal part of the eye. Continuously produced by the ciliary body, the aqueous humour then drains through the trabecular meshwork at the drainage angle to keep eye pressure at a normal level. The choroid is a layer of tissue packed with blood vessels that is located between the sclera and the retina. This blood supply ensures that the retina and back of the eye are well nourished. Located between the iris and the choroid, the ciliary body helps with holding the lens in position, changing its shape when focusing or accomodating, and producing aqueous humour. The muscles in the ciliary body alter the shape of the lens when focusing – they contract when looking at nearby objects and relax when looking at faraway objects. This process is called accommodation. This is the clear, thin membrane that lines the inside of the eyelids and the white of the eye. It helps to keep the eye moist and lubricated, and protect it from debris and infection. The conjunctiva also contains tiny blood vessels to supply oxygen and nutrients to the eye and eyelids. The cornea is a curved, clear layer that forms the front of the eye – it can be thought of as the eye’s ‘windscreen’. Light enters the eye through the cornea, which then bends (refracts) the rays before they pass further through the eye. This is the part of the eye at the junction of the iris and cornea. Aqueous humour drains out of the eye via the trabecular meshwork and enters the bloodstream in order to keep the pressure in the eye stable. This meshwork is located at the outer part of the iris, where it meets the cornea, in a small area known as the drainage angle. This is a small pit-like structure in the central area of the retina, which contains only cone light receptor cells (no rod cells) and provides the sharpest vision. 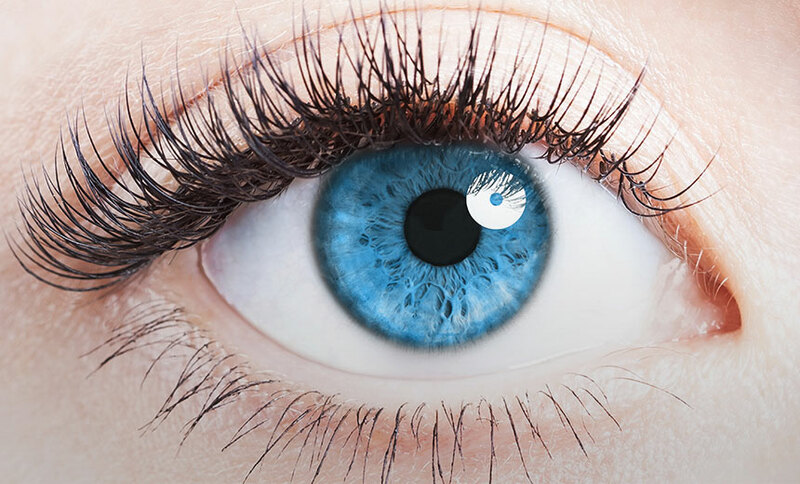 The iris is the coloured part of the eye that sits behind the cornea. Its role is to control the amount of light entering the eye by adjusting the size of the pupil (the opening in its centre). Located directly behind the pupil, the lens is a clear, flexible, disc-like structure responsible for focusing the light entering the eye. When light passes through the lens, it bends (refracts) and focuses on the retina at the back of the eye. The lens can change its thickness and curvature to focus on objects at different distances and to make sure that the image is as clear as possible (this process is known as accomodation). This small and highly sensitive area in the central retina is responsible for seeing fine detail, such as letters and faces. The optic disc or optic nerve head is the circular area on the retina where the optic nerve enters the eye. The optic nerve is a bundle of more than 1 million nerve fibres that carries electrical messages from the retina to the brain for processing. The posterior chamber is the area of the eye behind the lens and in front of the retina. It is filled with the vitreous humour, a clear gel. The pupil is the dark, round area in the centre of the iris, which is actually an opening. After passing through the cornea, the light rays pass through the pupil, which opens and closes to adjust how much light can enter. The pupil gets larger (dilates) when exposed to low-light conditions, such as those experienced at night, and gets smaller (constricts) in bright light. The retina is a layer of photoreceptor (light-sensitive) cells that line the inside of the eye. The retina has two types of cells called rods and cones. Rods process light in low-light conditions, while cones process light in well-lit conditions and can see colour. Light rays that have been focused by the cornea and lens eventually reach the retina. The retina turns the light-ray activity (‘picture’) into an electrical message, which is sent via the optic nerve to the brain for decoding. The sclera is the white, structural tissue of the eye and is continuous with the clear cornea at the front of the eye. The sclera also continues around to the back of the eye and the optic disc. Consisting of thick connective tissue, it forms the supporting wall of the eye and protects its internal structures. These are small glands inside the upper eyelid, which produce the majority of our tears. Tears help to keep the surface of the eye moist and lubricated, provide oxygen and nutrition to the surface of the eye, protect the eye from damage, clear away foreign objects and help to prevent infection. The nasolacrimal duct on the inner eyelids helps to drain tears away from the eye. The collective name given to the iris, the choroid and the ciliary body. The vitreous humour is a clear, gel-like liquid that fills the posterior chamber of the eye. It consists of 99% water and 1% collagen, proteins, salts and sugars. Although mostly water, this fluid has a firm, jelly-like consistency. The vitreous humour sits between the lens and the retina. In contrast to the aqueous humour, vitreous humour doesn’t move – it is not replenished or drained away. Vision Eye Institute is the leading provider of ophthalmic services in Australia. Our team of highly regarded doctors includes general ophthalmologists, as well as those who specialise in specific areas/conditions of the eye.